This is an easy project using hairpin lace. 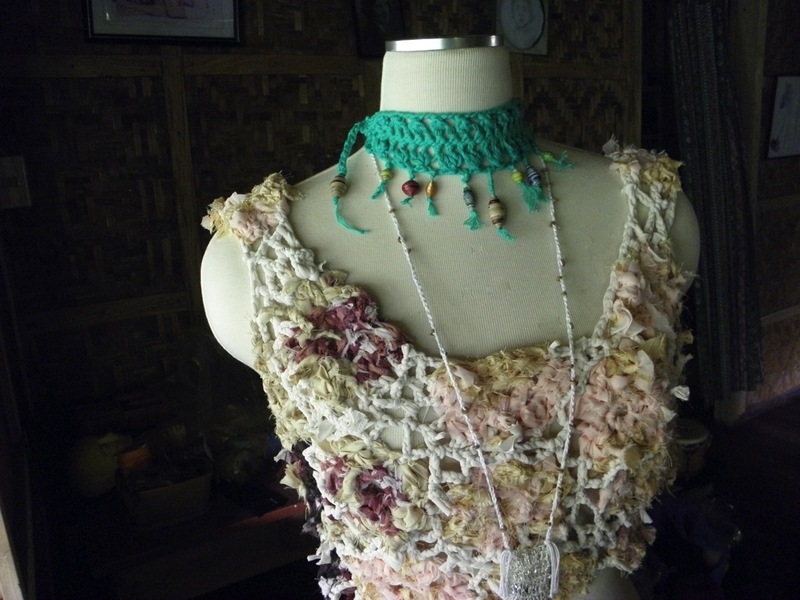 A strip of lace is made then tie and button hole are crocheted at each end, then beads are added. 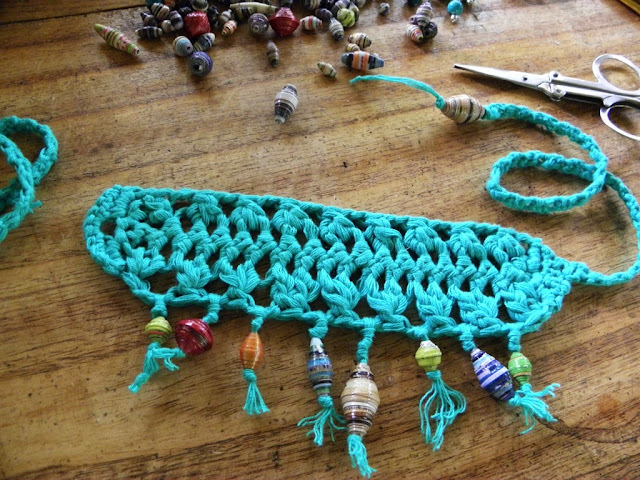 If you're threading beads, you can make your own bead threader, see this blogpost. 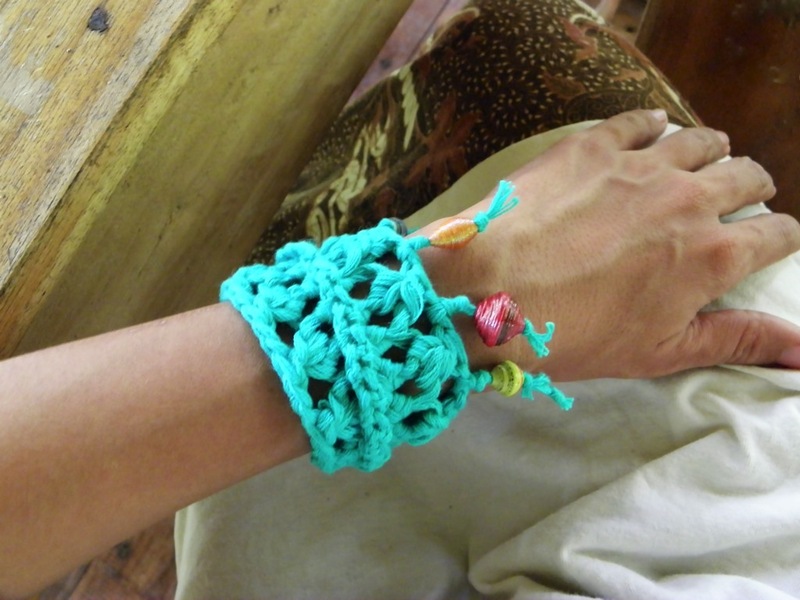 For this project, I used stranded (unplied) cotton yarn of about 12-ply weight. The yarn is a beautiful aquamarine colour, a gift from crochet friend Imeng. 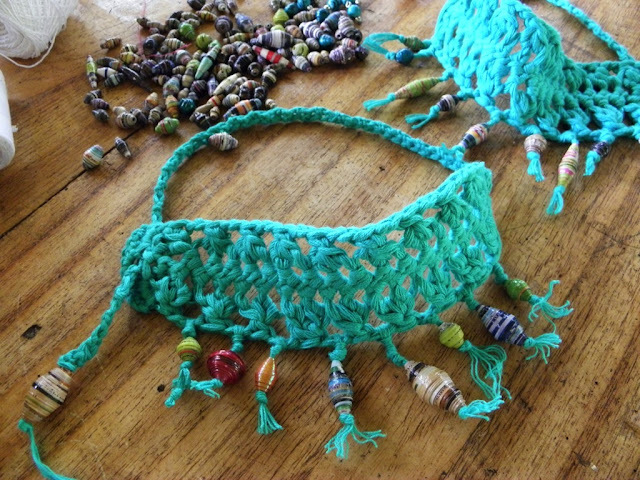 The beads used are rolled-paper beads, a gift from crochet friend Gerry, of assorted shapes, sizes and pretty colours that go well with the yarn. 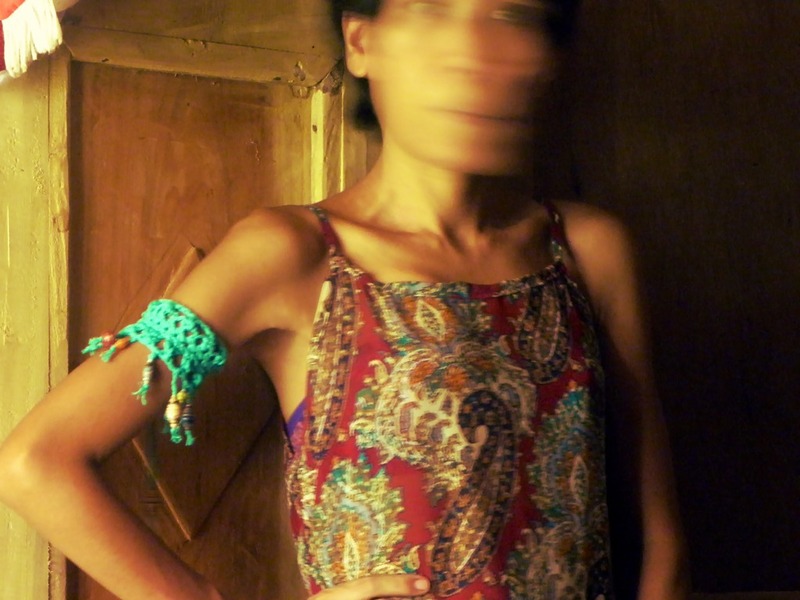 Armband measures 2" wide and 7.5" long. Tie measures 12" long with 3" fringe at the end. Armband can be adjusted to fit and may be used as bracelet, anklet or choker. On 1" hairpin lace staple using 3.5mm hook and two strands of 12-ply cotton yarn held together, make a lace strip with 20 loops on each side. Remove the lace strip from the hairpin lace staple. Ch 4, yo, insert hook in first loop, yo, insert hook in next loop, yo, pull yarn through 4 loops on hook, yo, pull yarn through both loops on hook, *ch 2; yo, insert hook in first loop, yo, insert hook in next loop, yo, pull yarn through 4 loops on hook, yo, pull yarn through both loops on hook; rep fr * on all loops along side of lace; after last loop, ch 4, sc in center tip of lace, ch 4 and work the other side of the lace the same way. End with ch 4, sc in center tip of lace to join. Fasten off. 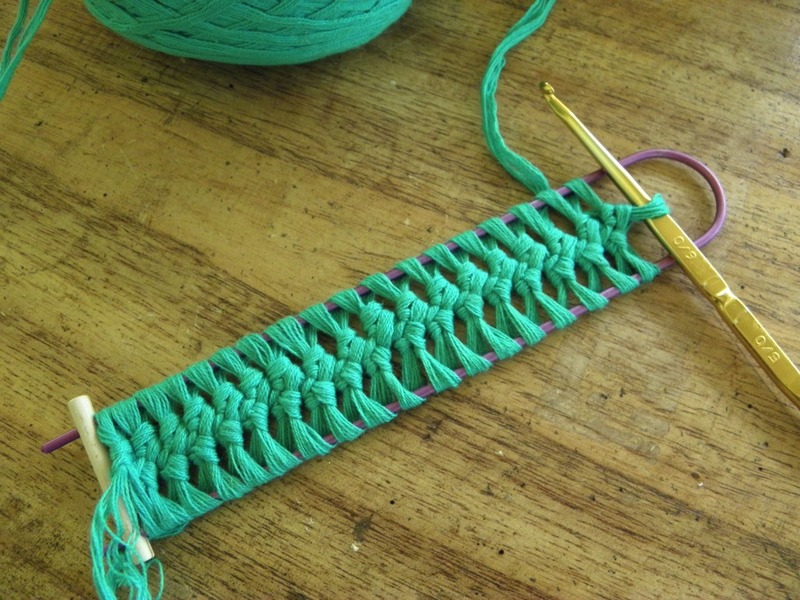 Join yarn to 4-ch sp at end of hairpin lace strip. Ch 1, 4 sc in 4-ch sp, ch 3, sk sc in center tip of lace strip (this makes the buttonhole), 4 sc in next 4-ch sp, ch 1, turn; sk first sc, sc in next 3 sc, 3 sc in 3-ch loop, sc in next 3 sc, fasten off. Join yarn to 4-ch sp at other end of hairpin lace strip. Ch 1, 4 sc in 4-ch sp, sk sc in center of tip of lace strip, 4 sc in next 4-ch sp, ch 1, turn; sk first sc, sc in next 6 sc, ch 1, turn, sk first sc, sc in next 4 sc, ch 1, turn, sk first sc, sc in next 2 sc, ch 1, turn, sk first sc, sc in next sc, ch 1, turn, sc in sc, *ch 1, turn, sc in sc, rep fr * until tie measures 12" long; fasten off with 4" tail. Using one strand of 12-ply yarn, use bead threader to thread the beads and with slip knot secure to 2-ch sps along one side of the hairpin lace strip. Tie a knot above and below the bead. 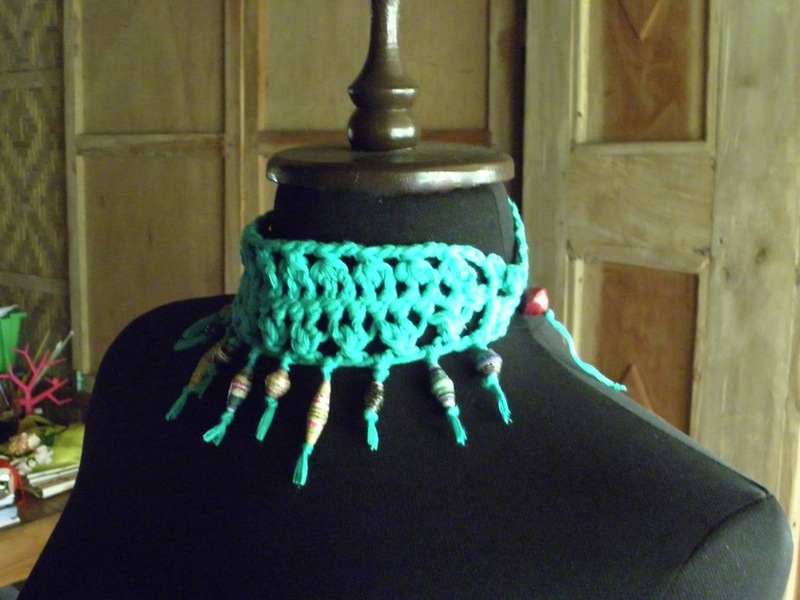 Make 10 beaded fringes. Trim the fringe with sharp scissors. Thread end of tie to large bead (large enough to fit securely to buttonhole) and secure with a knot. Knot tail end and trim. Weave in all ends.